“What do you mean you have a cat in your car?” I asked. He proceeded to explain that a co-worker had been feeding a stray cat at his home and that this morning she showed up injured. He tried to take her to the Humane Society but they weren’t open yet, so he brought her to Rick at work because he knew we fostered cats and found homes for them. I had my last class of the semester to conduct in 30 minutes and could not wait. I looked some phone numbers up for Rick, taught my class, and then went to his work. He was already gone with the cat. When I pulled up in my driveway, Rick was there, pacing. He explained that he had called every shelter in three or four counties and been turned away by all. One even said that he could bring her in, but that he would never be allowed to know what happened to her. He had already had our vet take a quick look at her, and she was still in his car at this point. It was possible that this cat could survive, but at this point the problem was that we had no where to place her. Our house was already split up into three sections with foster kittens in one area, our two long-term adult male companions in another, and a fairly recent adopted adult male in the third area. There was simply no space. I told Rick to go back to work and I took the cat back to the vet and had her tested for feline leukemia and x-rayed, while I went home and tried to figure something out. I even called my mother in Illinois to see if she would take her. My mother told me once again that I could not save EVERYTHING in this world. Thinking about the fact that it was she who brought me up Catholic, I said to her, “But Mom, what would St. Francis do?” She had no answer. After I hung up the phone, I went into my bedroom and found my favorite St. Francis holy card and went outside on my back deck. I looked at the card intently, and then looked out at my dormant garden at the St. Francis statue standing in the center. St. Francis has been my husband’s and my favorite saint for a long time, but right now his compassion became more clear to me than ever before. I also thought of the words a girlfriend had told me when she was going through a depression after her two kittens died of FIP. She said that she initially thought: “This is stupid. They are just animals. I have to snap out of this. Then I remembered that the Bible says that God cares about even the sparrows, and I realized it is okay for me to mourn these creatures; that God cares about them, and so do I.” I realized at that point that I must do as St. Francis would, and save this cat even if we had to dip into our emergency fund to pay for it. I thought that if we focused on saving her, that God would provide. This was Holly before she could walk. Twenty minutes later I got a phone call from a local sanctuary saying that they would help. Next, our vet gave us a break on the bill. Amazingly, the last two kittens I was fostering were adopted out, freeing up some space. The real miracles began to happen after I brought Holly home the next day. She had been crushed by a car from the last few vertebrae down and the vet said her left leg was entirely paralyzed and would need to be amputated after she regained some strength. She had very limited use of her back right leg and her tail was also partially paralyzed. The x-rays showed that the vertebrae had basically crushed around the nerves leading downward, causing this paralysis. Holly also had many abrasions, and the worst one was on the left leg, which was completely paralyzed. About a week after Holly came to our home, she began hopping around, following me around the kitchen on three legs. Then one night we noticed she had gotten litter into the major abrasion on the paralyzed leg, and so we began to clean it. I thought I saw her twitch a bit at first, but then decided I must be imagining things. I began to clean it again and this time she screamed and PULLED HER “PARALYZED” LEG all the way up to her belly! She had movement! Within the next week Holly was walking. She still tottered about, as the muscles had atrophied. However, either due to many prayers and some angels, or to Holly overhearing conversations about amputation, she made sure to show us as soon as she could that she was no ordinary cat. Every time we walked in the room, Holly got up and showed off her new walking skills. Because of her unsteadiness, she tended to circle sometimes, and I called her my tiny dancer, my Ballerina. Unfortunately, the miracles were over for Holly one day whe we woke up and she was stumbling around. I told Rick to go to work, that I was sure she’d snap out of it, pull another miracle, and I would watch her. She only got worse, from back end to front end, and she began having seizures everyday. Seizure meds did not seem to help at all. For two weeks we syringe fed her her and I carried her in my arms. 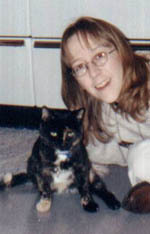 Bud, an old ex-tom cat would alert me to her seizures and run to lick her face. I ended up purchasing baby items like a monitor so that I could occasionally leave the room or go outside and know if she was going into a seizure. After a couple of weeks of carrying her around we realized her quality of life would not return. She could no longer even swallow. The seizures had caused too much brain damage. On Easter Sunday 2000, we let her go to rest. The only thing I knew to do with the pain and aggravation and anger and sadness I felt was to start working really hard to save others like her. And that is what we have done here ever since. After fostering for other groups it occurred to Rick and I that a real cat program was running here in our home. We actually built additions to our home strictly for foster cat space. We also now foster a limited number of dogs. But they are all here because one little cat taught us so much just before the Christmas of 1999. Her spirit lives on in all that we do.